• Puts debt-to-revenue ratio at 34 per centThe United States (U.S.) has urged the Federal Government to address gaps in confidence level and trust among citizens.Nigeria’s greatest asset is its citizenry without whose support and trust, achieving sustainable development, despite support from allies would be difficult, said U.S. Ambassador to Nigeria, W. Stuart Symington.The advice, at the Financial Times (FT) Nigeria Summit, in Lagos, yesterday, came after some Nigerians expressed disappointment over President Muhammadu Buhari’s Democracy Day speech, where he listed his achievements. Symington noted that the country’s leadership could maintain stability through its dealings with the citizens. According to him, the best security Nigeria could afford is providing jobs, education and ensuring justice for all. 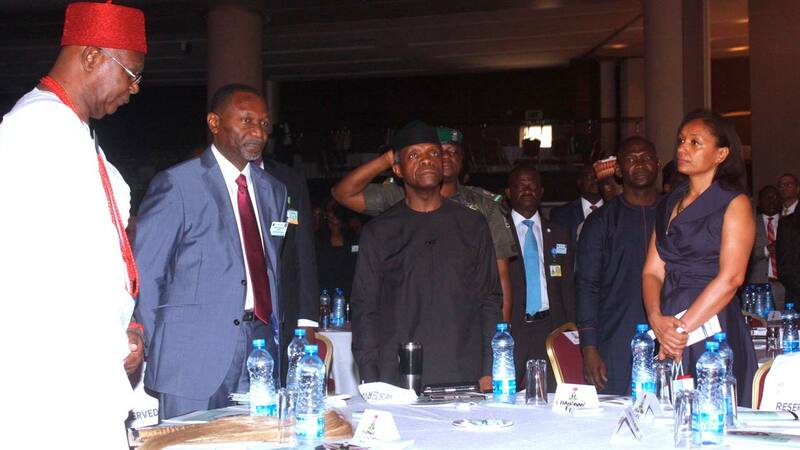 Vice President Yemi Osinbajo, who was also at the event titled, “Dispelling Uncertainty and Building Resilience”, told the investing community that the country’s economy has overcome uncertainty, citing 15-month falling inflation, global ranking on ease of business and external reserves at over $47 billion. Persons underestimating the country’s current revenue profile are living in the past, as the debt-to-revenue ratio is now 34 per cent, against 66 per cent, he said. He also disclosed that a lot of work and consultations are ongoing with regard to government’s stake in joint venture businesses and privatisation of assets. “If you look at figures of November and December 2017, you may not get the actual revenue and might conclude that it is very high. It’s only those that are raising alarm that are only focusing on the past records,” Osinbajo said.He noted that Nigeria’s debt-to-Gross Domestic Product (GDP) at 21 per cent compares favourably with that of Ghana at 70 per cent, South Africa at 50 per cent, and the U.S. at about 100 per cent. The Director of African Department at the International Monetary Fund (IMF), Abebe Aemro Selassie, said that while Nigeria’s economy has shown resilience, amid price and production shock in the commodity market, it needs to do more, now that oil price is favourable.He said the country needs about 15 per cent tax-to-GDP ratio to leapfrog the current revenue crisis, and should pursue productivity through the provision of much-sought energy. He also urged the country to seek increased trade flow to regional markets, not just self-sufficiency, while government must ensure that agricultural policy, as a diversification strategy, is implemented effectively. The Minister of Budget and National Planning, Udoma Udoma, noted that the administration inherited a faulty system, but government immediately scripted expansionary policies to keep the economy afloat.He said the Strategic Implementation Plan, with a list of about 30 key priority areas, was complemented by a three-year economic plan that helped to overcome recession.Udoma further disclosed that the administration recorded significant capital releases in the country’s budget history, as the 2016 and 2017 schedules achieved about N2.7 trillion.